TT #98 Is it Time to Update Your RV ‘Peripherals’? During a cross-country trip in which we boondocked (or dry camped) many nights, in addition to staying at a selection of RV parks, I reflected upon the equipment we use while RVing. Like many, we transferred our water hoses and fittings, specific waste fittings compatible with our brand of sewer hoses, barbeque (grille) propane hoses and accessories, electric extension cords and adapters and tow bars along with the related towing equipment as we moved from one RV to another. Over the years, we added new pieces, both as replacements, as well as expanding our selection for the ever-increasing size and complexity of our RV and towed vehicle. When one takes this approach, some replacements are not exactly compatible with existing ones. As an example, I prefer to use quick disconnect water fittings for all water connections. Starting with one hose and two sets of fittings we expanded to four hoses of various lengths, tees, pressure regulator, anti-siphon fittings, splitters and their associated connectors. We have a dedicated hose for the RV’s waste tank flush system and a short hose used when the water connection is very close to the RV. Longer ones are used in parks where the water tap is a distance away from the RV. Duplicate this for the electrical, waste and LP (propane) systems and we have accumulated a lot of pieces and parts. Earlier this year, we occasionally noticed the faint smell of LP wafting around the outside of our RV. (I check the onboard system for leaks each year, something I highly recommend.) We checked all LP hose fittings for integrity and did not find loose or leaking connections. With the smell of propane persisting, I tested the hose to hose connections and the hose to fitting connections using a leak detection spray. Finally, I found the source of the leak: The hose fittings that were simply clamped with a factory installed 3/8” (1.0 cm) band of copper crimped over the hose to retain the fittings (See Photo). LP was leaking at the ‘connector to hose’ junction. A trip to the LP supplier to buy new hoses resulted in a discussion with the LP supplier. I discovered that all newer hoses have a specially designed ‘surround the hose’ crimp that is ¾ inches (2 cm) long. (See Photo) This provides a much more secure and durable connection to the hose fitting. The supplier confirmed that our hoses were still very safe and that all fittings could be replaced on the existing hoses with the new crimped clamps. Doing that eliminated all hose leaks. We still noticed the occasional smell of LP on a still night, when not using the grille connection. I checked all tank fittings with the leak detection solution and discovered that the LP ‘Tee’ connection (see photo) installed between the regulator and the tank valve was leaking internally. This ‘Tee’ allows high pressure LP to be fed through the hose to the BBQ grille using the RV’s onboard tank rather than the small replaceable portable tanks. There was a leak inside that ‘Tee’ that allowed LP to seep by the internal seal even with the cap installed. I replaced that fitting, which had seen service on two prior RV’s and had been transferred to our current coach. It was simply getting old. Over the years I’ve replaced and upgraded our waste hoses, ensuring each new selection matched with the system that I’ve been using. Regular inspection of these hoses is necessary to ensure that there is no leakage from the RV to the dump connection. We’ve also learned that less is more. While we tended to have longer hoses ‘just in case’ the connection is a long distance from the RV, I’ve learned that it is such a rare event that having just two 10-foot (3m) lengths of hose length is usually all that is required. Deciding to do with that length, which get routinely used and replaced greatly reduces the failure rate. So, what about the freshwater hoses? We have three hoses: a short 10-foot (3m), an 18-foot (5.5m) and a 25-foot (7.6m). This selection allows connection at most campgrounds. These hoses are long enough to reach the roof when required. (I do not use hoses to wash our coach.) I prefer to use quick connections on each hose and I’ve added them at various times over the years. Unfortunately, not all were the same style to match the existing connectors. Wear played a factor as well, resulting in dripping connections. The result was that I had a mixture of old and older mismatched fittings that were leaking and a pain to use ‘quickly’. I purchased one style of quality connectors, built a system that is consistent, installing each with new washers. That resulted in a superb, leak free, quick to connect and disconnect water supply system. Improvements in the fittings allow disconnection under pressure without leaking, which was an additional bonus. Critical electrical adapters and cords also wear from lots of use. The difference is that rather than a fluid or gas leak, an electrical ‘leak’ shows up as heat, intermittent operation, or an electrical problem. The molded cord ends are subject to failure at the cord to connector junction which can generate heat as the internal connection slowly fails. Often, we are fooled by the look of the connection since we cannot see the actual power carrying wire. Fortunately, with each new RV, a new line cord is supplied. When the metal tabs show discoloration, they demonstrate excess heat build-up from a poor connection. See the brass terminal, now copper colored (arrow) in photo. Fifty (50) to Thirty (30) Amp dog-bone or simple plug-in adaptors are also prone to failure. Buying a name brand adaptor with heavy gauge wire and good quality insulation will payback in longevity and dependability; however eventually even it will need to be replaced. When hooking-up to a park pedestal, I recommend using the Fifty (50) amp cord most larger RV’s come equipped with, as much as possible, adapting it, if necessary. This will allow better current flow to the RV with just the short, smaller wire gauge adapter being the weakest link. This contrasts to the approach I’ve seen where many RVers prefer to use an easier to manipulate Thirty (30) Amp extension cord and an adapter on the end of the Fifty (50) Amp RV cord stored in the compartment. This approach extends the amount of wire through which the power must travel, increasing the potential for damaging heat when large power consuming appliances, such as air conditioners are used extensively. Using the larger cord with its larger gauge wire combined with the single adapter shortens the distance that power travels. While not used as often, Cable TV wiring also wears and should be inspected regularly, if signal loss is apparent. The last area to look at, is the towing system. It is surprising to me how often I see a 10,000lb (4,536 kg) tow bar mated with a pair of 5,000lb (2,268kg) safety cables towing a SUV or pickup truck. When I see this situation, I know that the towbar is many years old, since all major towing companies include safety cables matching the towbar capacity for many years. How worn is the towbar? Is there evidence of metal fatigue or failure? Are the extendible shafts below tolerances? How many miles has it been used to tow? The industry recommends replacing a towbar after five (5) years. While this may seem to be a generalization, we’d all agree that use does result in wear and having the towing system evaluated for safety, especially when a replacement tow vehicle is put into service, is a wise approach. Likewise, I look at the wiring connectors and extension cable. If it is a straight cable (not coiled) and has a four-wire connector then it should be upgraded. While running lights, signal and brakes only require four wires, today all coaches are equipped with a seven-pin blade connector and the quality of the adapters, and connections of a six-pin extension cable and its matching connectors make the electrical connections far more dependable, in addition to providing a couple of additional wires for charge lines, and braking systems that were never part of the picture when the original four wire connectors were implemented more than twenty-five (25) years ago. So how about you? 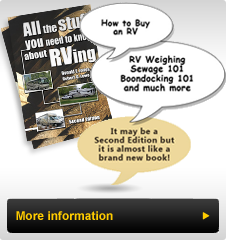 When was the last time you examined all of the peripheral equipment that goes along with your RV? Are you making do? Do the hoses or connections leak, are the electrical connections worn, has the tow system seen its best days? Stop and seriously look at all systems for safety and integrity. As the saying goes: ‘A chain is only as good as its weakest link”. How is your chain?